Opening in September 2015, Strongpoint Shooting Complex rapidly established a reputation for being a fun, exciting and most importantly a safe recreational experience for you and your family. 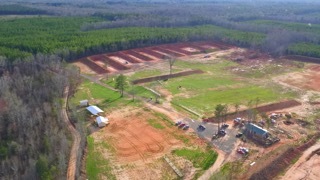 The 50 acre complex offers an impressive 400 yard rifle range with steel targets at every 100 yards. Also there is a rifle area for zeroing with targets at 25, 50 and 100 yards. The pistol bays are 50 yards deep and can accommodate a small group. For the marksman that likes to shoot steel Strongpoint has specialty steel bays full of competition steel. Targets, ammunition, eye/ear protection, t-shirts, decals and snacks are available to purchase in our shop. Gun rentals are available too. Strongpoint Shooting Complex also offers instructional classes for beginners to experienced marksman. Basic Pistol for Beginner, Basic Pistol for Advance, Basic Rifle, USPSA basic and advanced and various 3 Gun prep courses. Please check our Course Page for schedule of available courses. Customers have the choice of membership with all the membership advantages or of course walk-in day passes are always welcome. We offer discounts to military and first responders. Our staff has a wide range of expertise and are very willing to help if needed. Be sure to check out our face book page to keep up with our scheduled competition matches and league meetings. Our gun range is just a short drive from Columbus/Ft.Benning in Waverly Hall,GA. From Columbus take Manchester Expressway North to Waverly Hall. Turn right on Highway 208 (past Cooper Foods) and we are 3 miles down on the left. Membership is not required to use our gun range. We are open to the public and offer a discount to military and first responders.